To be honest, I didn’t think this week’s French Fridays with Dorie dish was going to happen. I had goat’s cheese at home and this morning I bought a punnet of strawberries and a baguette. I started the day off with good intentions. I mean, come on! Of all recipes, I decided that this one was too hard? It’s not even really a recipe! Nevertheless, the decision was made and I would just wait until next week and get back on track. Fridays we tend to just hang out on the school oval and the mum’s chat while the kids play. By the time we walked home, my older two kids were home from high school with varied friends. My husband had come home from work. I noticed my husband was going through every cupboard in the kitchen, snacking on random things. Topped it with halved strawberries. And drizzled some balsamic vinegar…. And I barely had the chance to take a photo before it was gone! I almost felt embarrassed I was going to skip it! And it would have been an absolute shame because this effortless dish was delicious. I am looking forward to reading what the rest of the French Fridays with Dorie group. 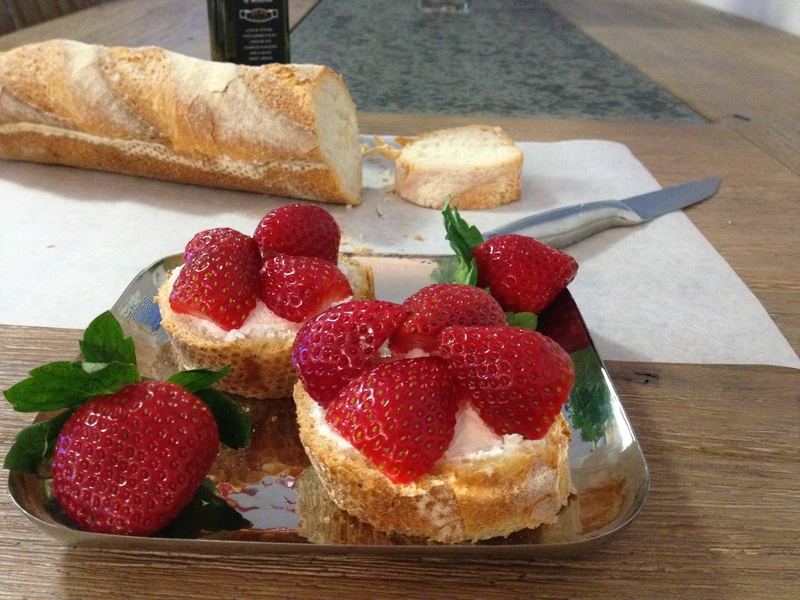 Tags: cooking, food, french fridays with dorie, recipes, strawberries | Permalink. I thought these were delicious too. I totally see how you could end up thinking it was one thing too many. Happily you had everything on hand for the last-minute treat!!! Yes, the hardest thing about this one is the shopping. It’s amazingly easy, especially because it tasted so good! Glad you didn’t skip this one. Oh I hear you girl. I left work last night and gave brief thought to just skipping this one as I was running late and it was ‘too hard’. I even had everything already at home so not swing by the grocery store necessary. How silly of me. I have them sitting next to me now again this AM for breakfast! These were lovely and not to be missed. Yes, it was truly too hard… to resist. These disappeared quickly in my house as well! It’s funny how even the simplest things can seem like an enormous bother sometimes. I’m glad I got up the gumption to make these this morning. They made a lovely breakfast! for me the bother was finding the goat cheese. i had to go a little out of my way to find it. but once i had all the ingredients in my fridge, it was a breeze. glad you decided to make them. This would be a great after school/work snack. So happy that you broke down and made it. I wouldn’t want anyone to miss this one, just way too tasty. These were really beyond easy…I make sandwiches for my husband that take longer to put together. However, you are so right…just wonderfully delicious! Glad you were able to stave off the hunger of your husband with this delectable tartine! What a lovely ending to a –She-was-seriously-going-to-skip-FFWD’s-strawberry tartine recipe– Post. Just so easy, and it looks so darned pretty when it’s plated. Glad you had the ingredients on hand. Glad your husband was hungry. Glad you made this. Looks nice. 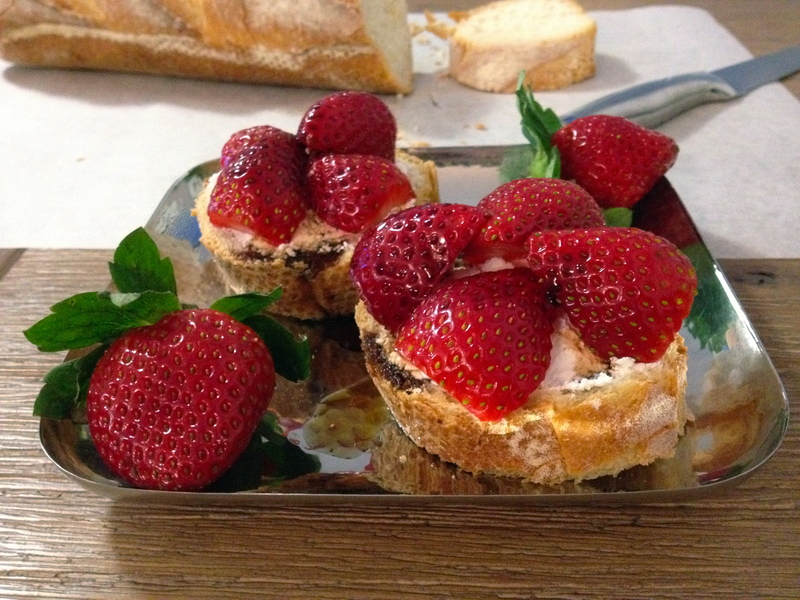 Very nice presentation of your strawberry tartine with all those lovely strawberries! This is a nice addition to the “quick recipe/appetizer” file – it was nice to read that everyone who prepared this really enjoyed it as well.